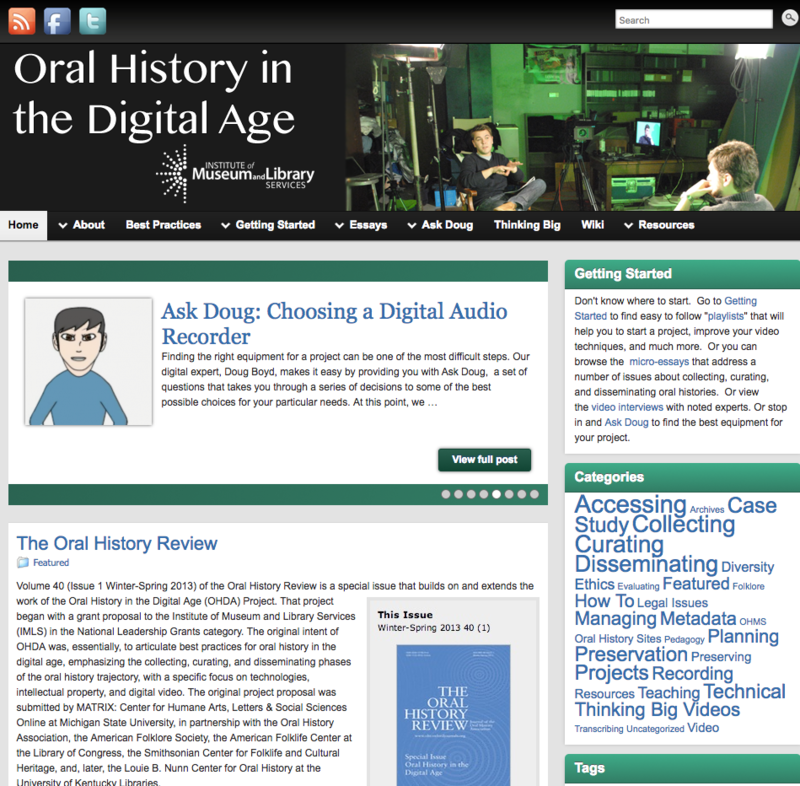 The Oral History in the Digital Age (OHDA) project serves as a central resource for individuals or organizations looking to do oral history work in the age of digital tools and technologies. The website features numerous essays, articles, and videos about collecting, preserving, and disseminating digital oral histories. Taken together, these articles comprise a series of best practices and recommendations for contemporary oral history work and provide detailed strategies and approaches for all stages of the oral history process. The OHDA project represents a partnership between MATRIX, the Michigan State University Museum, the Smithsonian Institution Center for Folklife and Cultural Heritage, the Library of Congress’ American Folklife Center, the American Folklore Society, and the Oral History Association. Seven interdisciplinary working groups composed of experts and practitioners from museums, libraries, and scholarly societies worked to produce recommendations around core topics including intellectual property, transcriptions, digital video, technology, scholarship, preservation, and access. Final recommendations from all groups were compiled and published on the OHDA website as a guide to conducting digital oral history. The need for this project stems from the way in which twenty-first century, digital technologies are transforming oral history. As mobile devices, digital recorders, online repositories and the like become more prevalent, oral historians need to be educated as to new methods available— as well as the risks and rewards of those methods. Thus, the OHDA is a valuable and timely resource that helps answer questions and provides relevant, contemporary best practices and recommendations to oral history practitioners. We encourage you to leverage the assets available on this site as you think about, develop, and conduct oral history work in the digital age.